Robert De Niro is without a doubt the star of “The Intern” which also stars Anne Hathaway as the boss of a startup eCommerce website. 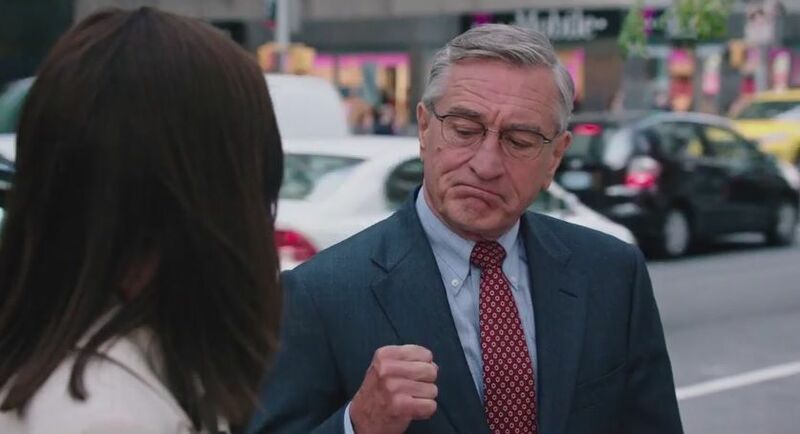 Ben Whittaker (Robert De Niro) is a 70 year old retired widower trying to shake up his boring life. Ben ends up as the Senior Intern at All About Fit and is assigned to the founder Jules Ostin (Anne Hathaway). Jules is reluctant to work with him or even engage in any manner of sorts, but as the movie progresses predictably Ben ends up being indispensable confidant and friend, or rather as Jules says Intern/Best friend. Jules is facing challenges both at work as her investors force her to hire a CEO and at home with her husband Matt (Anders Holm). For a long while Jules disregards Ben not knowing what an old geezer will teach her. The Intern is pure fantasy set in a real world which is an easy pill to swallow thanks to the affable Ben and the delightful chemistry between the boss and the intern an unlikely pair as you will ever find. The Intern like all Nancy Meyers’ films is fluffy, frothful, playful, sun kissed irresistible even though it is not that good. The supporting cast is a fine bunch of endearing characters but don’t particularly leave behind an impression, though Jules’ daughter Paige (JoJo Kushner) is adorable in her character and has few adorable scenes with Robert De Niro which leaves you smiling at the genuine warmth on display. De Niro is refreshing as the ultimate do it all types patriarch figure around the firm. Though the script is not at all demanding for him as an actor and he barely breaks a sweat as all he has to do is be affable and have the grandfatherly twinkle. De Niro recently stormed out of interview when he was questioned about it, although for one of the greatest actors of this generation the role is an easy innings. The screenplay is quite formulaic in its writing and at often times devoid of any sort of strong content barely deviating from the usual. Meyers does thankfully provide a surprise when all along the film it looked like De Niro could be the CEO and that would have the a very cliched resolution but thankfully it turns out different nor does she go anywhere near of bringing an romantic track between the two. While watching The Intern comparisons with The Devil Wears Prada could not be helped which also starred Anne Hathaway as the feeling of similarity lingered on though albeit Hathaway is the boss here and not the employee. De Niro recently stormed out of interview when he was questioned about it, although for one of the greatest actors of this generation the role is an easy innings. The comedy at best is down to the awkwardness of the situation, watching him interact with his younger co-workers and redundant scenes explaining how one should shave everyday and tuck their shirts in. One of the best comic sequences of the film is when Ben along with the boys (Adam DeVine, Zack Pearlman and Jason Orley) break into the house of Jules’ mother to delete an email from her laptop, that Jules accidentally sent to her mother. The scene leads to nowhere and is unnecessary fluff like many other. The comedy while amusing does not draw guffaws as stand-alone pieces but is rather out of place in the overall story and does not add to the quality of the story. The romantic track between Ben and Fiona (Rene Russo) had potential but sadly it is half baked and like majority of the script is tepid. The Intern is essentially a film about nice people, going about their comfortable lives with maybe an odd downhill moment thrown in. All the characters are goody two shoes without any blemish on them which tends to be rather one-dimensional. The climax of the movie is sort of an anticlimax as the situation faced by Jules with her stay-at-home husband Matt is resolved too easily and rather perfunctory. The movie is very well made technically and well shot. The strongest aspect of this movie is the crackling chemistry between De Niro and Hathaway, which alone makes it a good reason to watch this movie. It is without doubt that the two Academy Award winning actors bring life to characters which are not really well written. The Intern would have been a much better movie if was bit more focused and tad bit shorter, and sadly it burdens this middling star studded affair.